Where’s George (290/365) – Annoyingly Boring? I don’t enter them as often as I would like, but I did get this guy tracked at Where’s George. That is a cool stamp. Mine is boring… 3 lines of text. I need to upgrade. Probably not a smart idea to photograph your illegal activities. 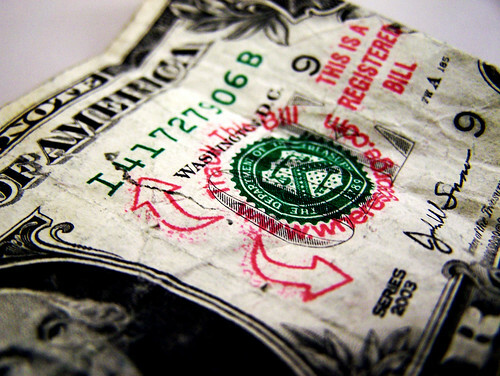 Marking dollar bills is not necessarily illegal. Doing so in a deceptive or fraudulent manner – or in such a way as to render them unusable – yeah, that can cause you a problem. Check with the US Treasury for more details. Personally, I choose to only track my c-notes. I find that Ben travels in far more interesting circles than George. That’s cool. I got one of those a few weeks ago too. I was thinking about this just the other day….its been ages since I received one! It’s fun to follow the $1’s journey. I only have about 160 hits, but I still get a kick out of getting the wheresgeorge email telling me my bill has been re-entered. I’m in Oklahoma at 3/4 of mine stay here or go to Texas. It’s fun when they do end up in NY. I actually did have one go overseas, and was entered in Iraq. That’s cool, because I can get my 7 year old to come check out the globe and actually learn something new.